You face a technical or procurement challenge? You want to conquer markets with outstanding products? We assist you in finding the perfect solutions for your applications and processes. In addition to the products of our partners we develop and produce own products that target specific needs of the food industry. These solutions receive the brand names BIFOSOL® and BIFOLINE®. Your task demands a tailor-made solution? Our application experts will gladly develop a unique product for you! 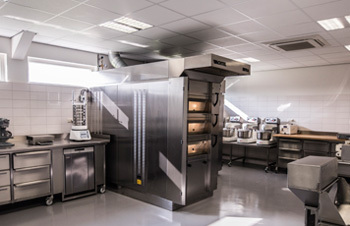 Welcome to our bakery lab in the Netherlands: Here we develop and test application specific product solutions for (fine) bakery and confectionery. For savoury applications we work together with cooperation partners in Germany. All BIFOSOL® products are produced in the European Union, mainly in Germany and the Netherlands. This way we ensure quality, safety and fast delivery times. On top, our production partners are e.g. IFS and BRC certified. Designed to tackle specific challenges. Made with the finest, selfsourced ingredients. All technical and regulatory requirements considered.